Fun Fact: Giotto Bizzarrini was fired by Ferrari during the "palace revolt" of 1961. He became part of Automobili Turismo e Sport (ATS)), a company started by the ex-Ferrari engineers to build a Formula 1 single seater and a GT sport car, the A.T.S. Serenissima. The Iso & Bizzarrini Owner's Club. The Iso & Bizzarrini Owner's Club was founded in December 1980. There is a very active Facebook Community on the group. Bizzarrini S.p.A. was an automotive manufacturer in the 1960s. Founded by former Alfa Romeo, Ferrari and ISO engineer, Giotto Bizzarrini, the company built a small number of highly developed and advanced sport and racing automobiles before failing in 1969. Originally Prototipi Bizzarrini s.r.l., the name was changed to Bizzarrini S.p.A. in 1966. The Bizzarrini marque has been revived with a number of concept cars in the 2000s. Mr. Giotto Bizzarrini was born in Livorno, Italy in 1926. He was the son of a rich landowner and came from a good family with strong roots in Tuscany and the city of Livorno. His grandfather, also named Giotto Bizzarrini, was a biologist who had worked with Guglielmo Marconi on his inventions, especially the radio, following which one of the Livorno Library sections was named The Bizzarrini Library. Giotto Bizzarrini graduated as an engineer in the University of Pisa in 1953. He taught briefly before joining Alfa Romeo in 1954. He worked for Alfa Romeo, Ferrari, Lamborghini, ISO and later built cars under his name. He also developed advanced designs for AMC like the AMX Sciabola project, and as style and technical consultant for GM in Europe and USA, top Japanese motorcycle marques and well-known designers such as Pininfarina. Today, he is still very busy, teaching and collaborating with the Roma University developing advanced projects and designing, building and developing his own sport cars. He often said: "I'm not a car designer, I am a worker". In August 1954 he started as an engineer at the 'Servizio Esperienze Principali' (italian: Main Experiences Service), where he worked with Ing. Nicolis. He was assigned to the development of the Alfa Romeo Giulietta chassis. He left Alfa in 1957 and went to Ferrari. A legend says that Bizzarrini arrived at Maranello to an interview with Enzo Ferrari driving one of his specials, a Fiat 500 based sport car called The Machinetta, that still exists today. Ferrari was truly impressed by the little car, and Bizzarrini immediately joined Ferrari, were he was quickly promoted to controller of experimental, Sports and GT car development. Bizzarrini worked at Ferrari as a developer, designer, skilled test driver, and chief engineer for five years. The Ferrari 250 GT 2+2/GTE, the 3 litre Testa Rossa V12 engine, the Ferrari 250 TR or Testa Rossa and the Ferrari 250 GT SWB (Short Wheelbase Berlinetta or Berlinetta Passo Corto) were influenced by his ideas and technical solutions. For one of the most successful Ferrari racing series, the Ferrari 250, Bizzarrini worked hard to develop the chassis, engines and advanced dynamic solutions. The Bizzarrini Iso Grifo A3C at Sebring 1965. Trouble with the brake fluid boiling led to many frustrations including a off-road excursion. 1964 ISO Rivolta GT racing in Group 7A (1963-1966 GT Cars over 2500cc) at the 2011 Rolex Monterey Motorsports Reunion. Iso Rivolta GT was a Giugiaro designed four seater with beautiful body, speed, comfort and handling. Iso Rivolta GT was a successful car for ISO, with 799 units sold. Powered by a 327ci V8 Chevrolet Corvette engine with a classic de Dion rear suspension design with pressed-steel monocoque bodywork over press steel frame chassis. Unveiled to press in 1963, production continued until 1970. The Iso Grifo A3L was a monstrous idea for a super coupé, the L coming from Lusso. The result of the brilliant Giugiaro and Bizzarrini working together, it was based on a shortened Iso Rivolta GT chassis and was debuted at the 1963 Turin show. The Grifo epitomised the Italian 1960s style with his handsome low and wide handmade bodywork. It was the fastest production car tested by Autocar Magazine in 1966 with a top speed of 160 mph (260 km/h). 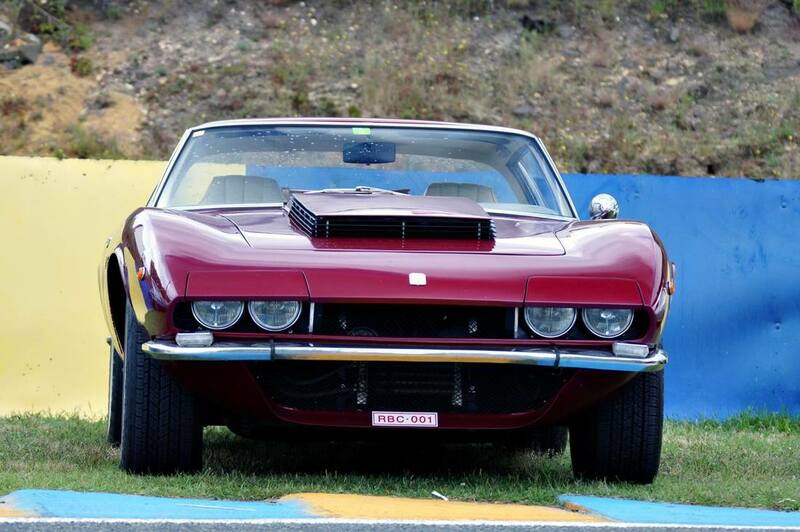 Later versions of the Grifo were powered by a big block Chevrolet Corvette 350 bhp (261 kW; 355 PS) engine. These 90 handbuilt units are distinguishable by the raised "pagoda style" scoop bonnet. Some of these Iso Grifo 7 Litri units were rebuilt later with even bigger engines. The Grifo's distinctive pagoda hood. The idea of Bizzarrini was to use the 3AL cars for competition. The competition versions of the Grifo were named Iso Grifo A3C, C for Competizione or Corsa. A new lightweight riveted aluminium body was designed and built by Piero Drogo. It was an aggressively designed machine, oriented to endurance races. It uses normal ISO underpinnings but the engine was moved further back in the chassis frame than the Grifo A3L, protruding well into the driver's cabin, fitted with hot cams and fed by four big Weber carburettors, giving more than 400 bhp (298 kW; 406 PS). ​Around 29 A3C sport cars were built under the ISO name. Five of these 29 cars were bodied in plastic/fiberglass by Piero Drogo at Carrozzeria Sports Cars in Modena. A3C's were widely raced. Some cars entered the 1964 and 1965 Le Mans 24 hour, 1965 Nürburgring 1000 and 1965 Sebring. It achieved a Le Mans class win in both years and a 9th overall in 1965 with no factory support. A3C's were one of the fastest cars on LeMans' Mulsane straight in both years. Due to the complicated deal with ISO, Bizzarrini left in 1964 and founded Societa Prototipi Bizzarrini (Bizzarrini S.p. A), which produced some 140 cars through 1969 at its Livorno factory. Mr Bizzarrini is still busy with personal projects and conferences. At the 2005 Geneva show, the new owner of the marque Bizzarrini showed the new GT Strada 4.1 concept, a two-door GT with a 4.1-litre 550 bhp (410 kW; 558 PS) plant (maximum speed - 360 km/h (220 mph), 0-100 km/h in 3.8 sec.) and was planned for production in 2007. In 2008, Giotto Bizzarrini is working in Livorno, building replicas P538 for American customers.